These muffins were a special request from Brad. The recipe is from a friend of ours, Shane. It combines oats, whole wheat four, bran cereal and flaxseed.﻿ It’s an easy way to add lots of whole grains and fiber to your day. If you are not familiar with flaxseed, it can be found at Whole Foods or some groceries. It has a grainy, nutty flavor that I add to yogurt or oatmeal every day. It is full of omega-3s and fiber. This is a great combination for absorption of vitamins and minerals while also keeping you feeling satisfied longer. 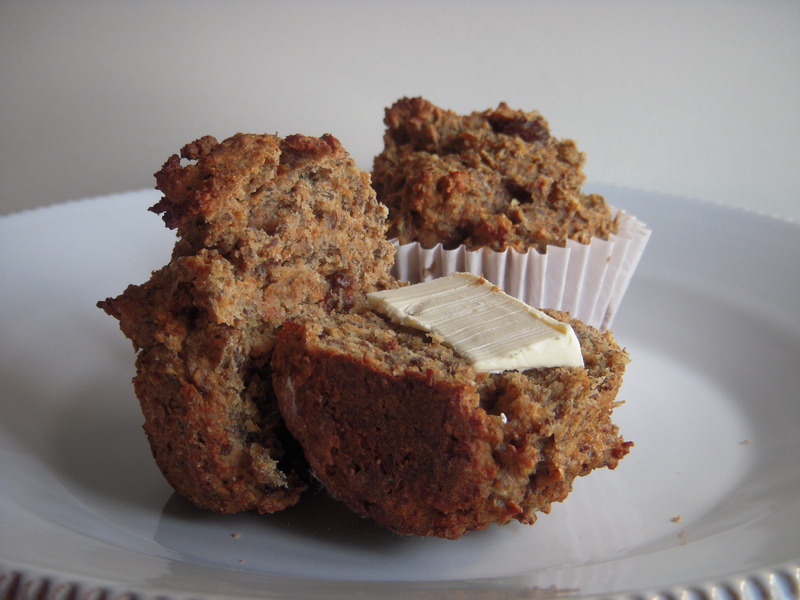 The ingredients leave you with a few options in how “healthy” you want to make your muffins. This recipe makes about two dozen. I like to bake all of them and freeze some in separate bags for later. Do the work once but enjoy them work-free later! Combine bran, oats and water. Set aside. Beat oil, sugar, and eggs. Combine baking soda, salt and flour. Alternate adding flour mixture and buttermilk to oil mixture. Add cereals. Stir in raisins. Spoon a heaping tablespoon of mixture into lined baking cups. Bake at 425 for 10-15 minutes.